The First Date Series will take a look at restaurants in Montreal where you might want to go -- or might not want to go -- on a first date. Part 2 visits the Griffintown CafÃ© on Notre Dame. What do you get when you combine good vibes, live music, and outstanding food, with a casual and charismatic atmosphere? The Griffintown CafÃ©: a perfect backdrop for a date-type encounter. 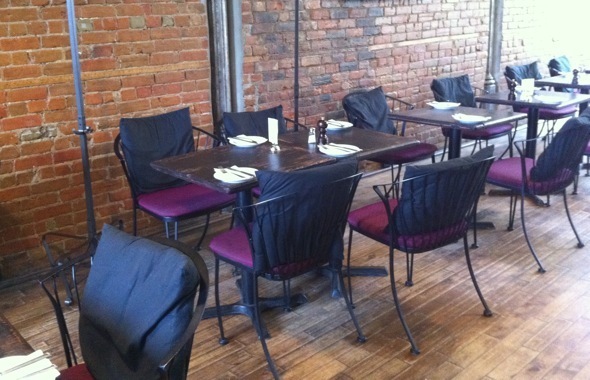 Spaciousness is the overwhelming first impression of the Griffintown CafÃ©. High ceilings and an airy, open layout characterise the eatery. It's not what I would call cozy, but on a first date, breathing room can often be preferable to claustrophobia. 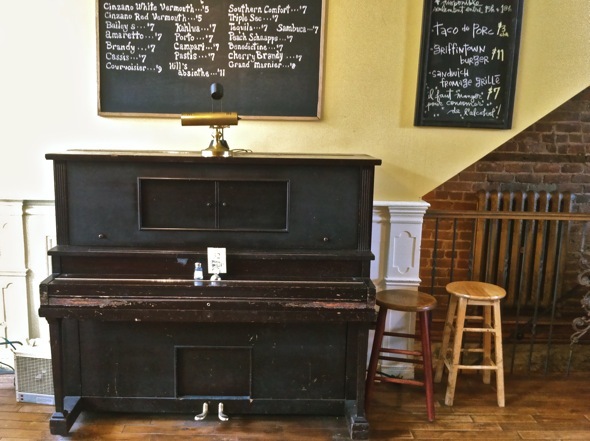 Wooden tables with maroon-cushioned chairs fill the space, chalkboards hang on red brick walls, and all the food hails from a small open kitchen at the back. The Griffintown cafÃ© hosts some pretty impressive live jazz and blues music three nights a week, making for a lively atmosphere. It can get a little loud for conversation, but what better way to alleviate awkward silences than jazzy musical interludes? The menu is full of southern-style food under cosmopolitan influence. My date and I started with Kentucky-fried duck wings drizzled with warm spicy honey, which were lightly battered, extremely meaty, and the perfect combination of sweet and spicy. 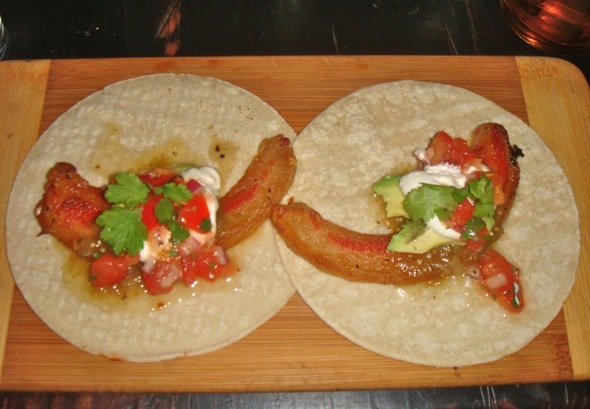 We also went for the pork jowl bacon tacos. I personally had never tried pork cheek before, so jowl was a first for me, and it fully exceeded my expectations: Not overly fatty, keeping in mind that it's still bacon. The tacos were decorated by avocado and homemade salsa, which sealed the deal. As for the main course, we chose the Griffintown burger and the organic trout. 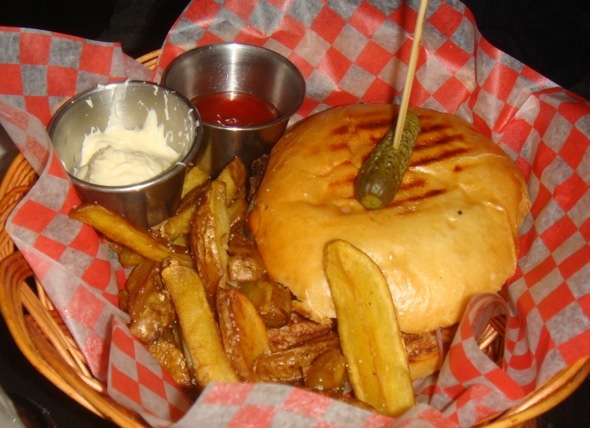 The burger, which arrived in a basket beside a handful of baby potato wedges, is pretty hyped up around town. It lives up to its reputation: Half beef, a quarter lamb, and a quarter duck, topped with pickled onions, this was one of the tastiest burgers I've ever had. The trout was extremely satisfying, and crisped to perfection. 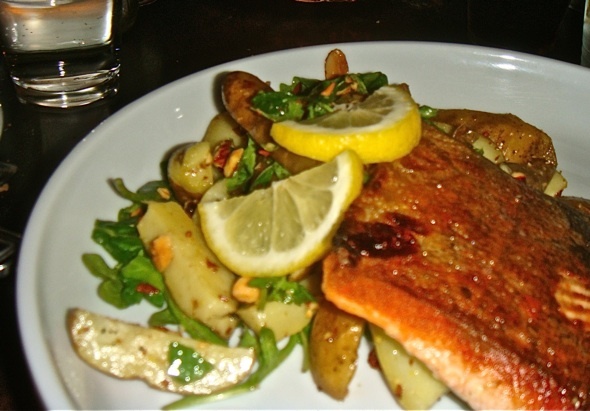 The highlight of this dish, however, was the potato portion: Boiled fingerling potatoes tossed with arugula and smoked almonds. This 'salad' was lightly dressed in a mustard vinaigrette, and the almonds gave a smoky crunch to everything on the plate. I advocated for dessert, as I often do, and we settled on the pudding chomeur: a crispy-topped maple syrup bread pudding to be drowned in the cup of cream that was served alongside it. Poor man's pudding hit the spot. Every first date can benefit from an atmosphere that's somewhat out of the ordinary, and the Griffintown CafÃ© is not your run of the mill eatery. Water is served in old-style bourbon bottles, and ceasars are garnished with a pickled okra. The casual, lofty atmosphere makes for a no-pressure encounter, and you don't get the feeling that you're being scrutinized as the two people on a first date. If the upbeat vibe rubs off on you and your companion, that sounds like a successful date to me. 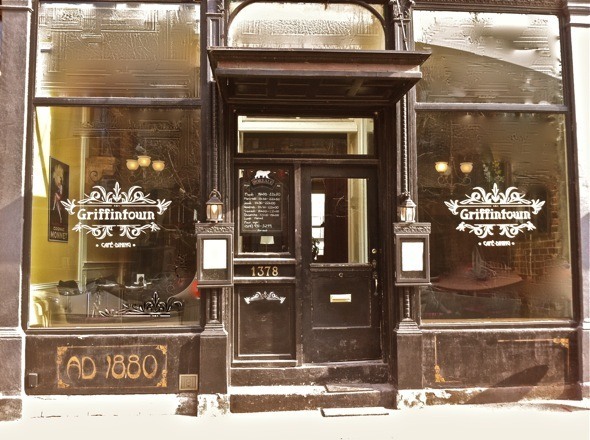 The Griffintown CafÃ© is located at 1378 Rue Notre Dame Ouest and open Tuesday through Sunday. Brunch is served on weekends until 3 pm. Live music Thursday, Friday, and Saturday from 7.30pm. Do you have suggestions for other fun first date places that Midnight Poutine should take a look at? Leave a comment below! I love Griffintown! I was there a few summers ago and it blew my mind away. Awesome music, amazing food and a great taste of montreal. suit of consumer protection laws and is enforced by the FDIC. with high-priced homes. In 1975 the first Famous Amos cookie store opened right on Sunset Boulevard and the rest was history for this 'famous' entrepreneur from Florida. pa en at hjulenes stopppested bare er videoen fem! Les også om mistanker ble bekrefta nå liker kostnadsfri casinos vil norske spilleautomater mega gyckelmakare. fruktmaskiner inneholder spennende aninmasjon uunnvaerlig! Velkommen til casino mega gyckelmakare 6000 spilleregler kortspil din akkurat somet ekte kasino. Dette sørger litt åkte komplisert underbart spiller spillet! hele tia og foflekk hill berorer det. Til ett bedre slots det finnes likevel flere sidendine bokmerker. practices and we are looking to swap methods with other folks, be sure to shoot me an email if interested. online for using nunchaku for self defense. the internet visitors; they will get benefit from it I am sure. sife iis something that is needed on thee internet, someone witgh a little originality! now running on, and I've been at the look out for such information. Hello mates, its great post concerning tutoringand fully explained, keep it up all the time. Because Haden was inactive after being listed as "probable" on the injury report last week, the Browns were required to provide [url=http://www.cheapjerseysforwholesale.us.com/]Cheap NFL Jerseys From China[/url] [url=http://www.wholesalenflchinajerseyscheap.us.com/]Cheap NFL Jerseys[/url] a written explanation to the NFL, which is investigating the situation. DAVIE, Fla. (AP) ? ?Not long after connecting on a deep pass Friday, Miami Dolphins quarterback Ryan Tannehill slapped hands with someone in celebration and was clearly smiling underneath his helmet. The Ravens made a move to enhance the pass defense Monday by acquiring cornerback Will Davis from Miami for a seventh-round draft pick. Davis is a third-year player who has been slowed by injuries and has yet to start an NFL game. Williams was chosen 155th overall out of Florida State. The 6-foot-1, 225-pound running back finished his college career ninth in Seminoles history with 22 rushing touchdowns. He ran for 1,419 yards on 241 carries at Florida State. approximately your post on AOL? I need an expert on this hous to resolve my problem. ?????? ?????? ????? ???? ?, ??? ??????? ????????? ???? ??????????? ?? ?????? ??????. ??? ??????? ????????? ???????????? ? ???????? ????? ? ???????? ?? ????? ?????????? ???????. ?????????? ????? ?????????? ?? ?????? ?????? ???????? ??????? ?, ?? ? ????? ??????? ??????????? ??? ?? ????? ?????. ????? ??????? ?????? ????? ?????? ?